Since 1983, Fudge Kitchen has been reinventing fudge, transforming it into a luxury product, comfortably competing with high end chocolates. Devilishly different in both taste & appearance, every flavour is made in small batches by skilled artisans who lovingly produce each piece by hand, using only natural, gluten free ingredients, reaping seven Great Taste Awards and one Food Manufacturing Excellence Award in the doing. Their success lies in the supreme quality of both product & packaging and in the singularity and variety of their lines, resulting from one of the busiest and most innovative NPD departments – Drinking Fudge and Fudge Sauces, gift fudge selections drawing on some 40 flavours, loose serve loaves and singles, and a new range of brittles and caramels. A proudly independent company: in-house food technologist: eight UK wide shops: an established 80-strong trained artisan staff – with own specialist production facility in Kent, Fudge Kitchen is uniquely placed to react directly to customer requests for developing & trialing products; to creating bespoke flavours, formats or personalised packaging. LBP (UK) Ltd are a leading supplier of high quality baked goods to coffee shops, restaurants, hotels, and smaller supermarkets. With years of experience in the food industry our team have the passion and expertise to deliver high quality products without compromise. 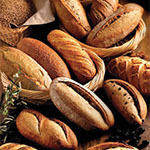 With a huge range of delicious authentic British and continental breads, sweet and savoury pastries, with an expanding dessert range, all bursting with flavour and texture, our artisan bakery supplies a unique range of exclusive baked goods to the food service sector. All this means your customers enjoy delicious, fragrant, traditional and contemporary continental products, baked with love, care and attention to detail. If you are interested in any products that you see in our brochure then please do not hesitate to contact our sales team to discuss your requirements. We stock a wide range of top quality chocolate aimed at artisan chocolatiers, bakers, caterers and anywhere that quality of ingredients is paramount. 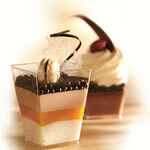 Whether its chocolate coverture chips or blocks, molded chocolate cups or mousses, decoration, chocolate sauce, coloured or bakestable chocolate, fountain chocolate,cocoapowder or after-dinner chocolates. It’s all available ex stock from our temperature-controlled store. 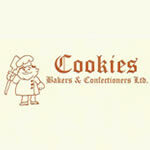 Cookies bakers and confectioners have been established since 1995. It is a family run bakery which prides itself on producing an extensive range of top quality breads, rolls, pastries, buns, doughnuts and confectionery. Ros & Simon Cook are based in the main bakery in Raunds, where they, with the other master bakers, produce everything from scratch. There are also two other retail outlets, one in Rushden, and the other in the quaint market town of Oundle. Come and try our delicious fresh bread or our famous ‘cookie slice’ or maybe a fresh cream cake!! You will be spoilt for choice. Wholesale deliveries are available six days a week and discounts apply on bulk orders, why not give us a try – you won’t be disappointed!! !